In our first part in this short series, we discussed the first of what we believe are three reasons why the world hates Christians as much as they do. One reason boils down to the fact that Christians are too often focused on individual issues, as we discussed last time. While it is true that the world (or more accurately, the human Elite led by Satan), creates those issues and draws society’s attention to them for their purposes, Christians can get easily sucked up into things so that we stop seeing people as people and instead, too often see them as issues. Once they become an issue and cease to be “people,” it’s easy to see them as enemies since many of those issues often stand opposed to biblical truth. Of course, while even well-meaning Christians can get caught up into the division over issues, those who merely profess to be Christians are clearly many among them. This brings us to our second point: the wheat and the tares. Matthew 13:24-30 presents this particular parable for us. Another parable He put forth to them, saying: ‘The kingdom of heaven is like a man who sowed good seed in his field; but while men slept, his enemy came and sowed tares among the wheat and went his way. But when the grain had sprouted and produced a crop, then the tares also appeared. So the servants of the owner came and said to him, Sir, did you not sow good seed in your field? How then does it have tares? He said to them, An enemy has done this. The servants said to him, Do you want us then to go and gather them up? But he said, No, lest while you gather up the tares you also uproot the wheat with them. Let both grow together until the harvest, and at the time of harvest I will say to the reapers, First gather together the tares and bind them in bundles to burn them, but gather the wheat into my barn. There are a number of important points that Jesus makes in the above parable. First, Jesus Himself is the “man who sowed good seed” of wheat. Notice that the wheat is always wheat in the parable. It never becomes something else or starts out as something else. It is wheat from beginning to end. Second, an enemy planted tares in the same fields where wheat had been planted. 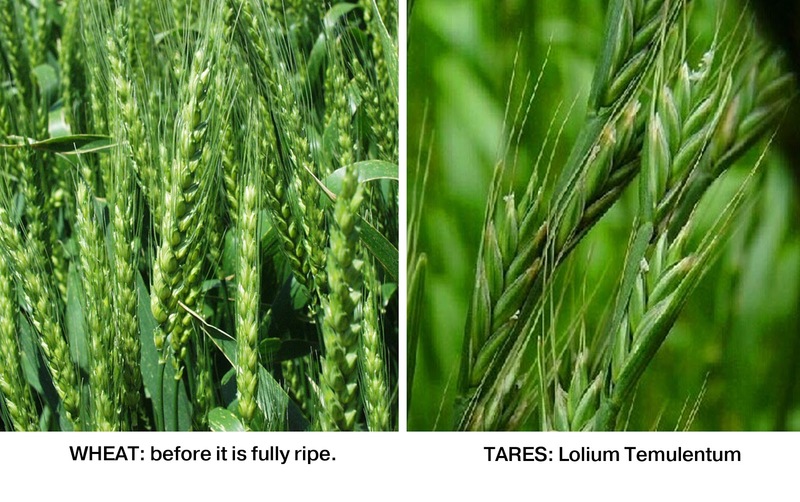 Tares are plants that tend to look very similar (especially when very young), to wheat so the enemy is clearly planting something that will appear to be similar in nature to the original crop in order to hide its counterfeit nature. The casual observer will not notice the difference. Please note the image included in this article for comparison. Third, the servants who were tasked with caring for and eventually harvesting the plants asked whether they should get right in and remove the counterfeit plant at once? The farmer said that they should not because they might accidentally rip out a good plant. This clearly shows that Jesus is willing to allow the tares to grow right up to the very harvest with wheat even though it creates more trouble for the wheat and the land itself. Jesus does not want to risk losing even one good plant. That would never happen, but He is emphasizing it for our benefit. Fourth, at the harvest, the truth about these two different plants will be very obvious. The counterfeit plants – the tares – that only resemble true wheat in the early stages, will be harvested and burned as being worthless. The wheat will also be harvested and saved (stored). What else can we learn from this? Clearly, tares are the false or professing Christians, people who, in some cases, may even actually think they are true Christians. They will tend to talk like Christians and even act like Christians. They’ll go to church and might even obtain teaching jobs in Christian schools and universities. They also might become pastors of churches. In short, it will be somewhat difficult for the casual observer to notice the difference between authentic (wheat) and professing (tares) Christians. In reality though, the latter group will not have had the necessary spiritual transaction that Jesus speaks of in John 3. Without the Holy Spirit, no real change occurs in them and they are still destined for hell. Do you think the world at large cares about the parable of the wheat and the tares? Not at all. In fact, they would likely do what they can to purposefully ignore it if they know it exists. If Christians attempt to use that in defense of Christianity (or themselves), they’ll be charged with simply making excuses. Let’s say what President Obama stated was actual truth though he provided nothing of substance to support his claims. 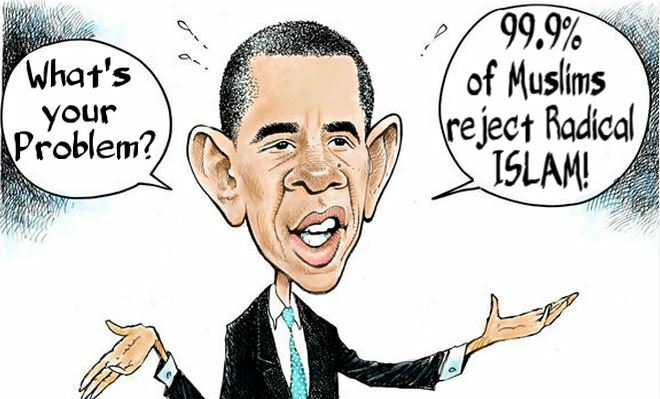 If it is true, then there are an awful lot of terrorist events being perpetrated by only 1% of the Islamic population. Generally speaking, many support his statement (though 1% still represents a very high number but presented as a percentage seems very small). Beyond this, when President Obama blatantly states that Muslims involved in terrorism are not true Muslims (my paraphrase), it is generally accepted as being a good enough explanation regarding the problem of terrorism. He also willfully refuses to label true terrorist events as terrorism, usually preferring to say it’s a problem with guns. Generally, people seem much more willing to go easy on Islam than on Christianity. If some Christian leader stood up and said that 99.9% of Christians reject “Christian right-wing fundamentalism” as evidenced in Dominionism, Christian Reconstructionism, theonomy, etc., no one would believe it because the news media is too busy trying to prove that Christians are hate-filled bigots. They often don’t have to look hard to find some example of it either. As soon as God birthed the Church in Acts 2, Satan lost no time dropping into each generation tares that would look, talk, and act like Christians. These tares would be used by Satan throughout successive generations including this current one to throw monkey wrenches into the works in attempts to derail God’s plans. Satan has never been successful in the long run and will not succeed. While it may appear that at times, he gains the upper hand, he is always on a leash and it is that simple. His defeat is accomplished at the cross, and his ultimate doom is certain because of it. In the meantime, the world sees true Christians (wheat) and sees professing Christians (tares) as the same. But tares will never be wheat nor will wheat ever be tares. That is not their intended purpose or destiny. True tares are agents of Satan designed to deceive and destroy. The world sees these tares and is not inclined to admit that they might not actually be true Christians. This stems from the fact that by and large, the world really does not know what it means to be a Christian at all. Things have become very blurred. To gain salvation where Christianity is concerned, the requirement is to believe in the work of Jesus Christ as a full Substitute for each of us (Acts 16:31; Romans 10;9). Faith opens the door, allowing us to receive from God eternal life as a free gift. What happens after that involves faith and work to submit ourselves to Him for perfecting. That perfecting will not be complete until we leave this life. Maturity in Christ occurs (or doesn’t) based on much effort we put into submitting ourselves to Him on a daily basis…just like any other intimate relationship. The world has no clue about this. They think Christianity, like every other religious system, is something that each person must “work out” for themselves. It’s a combination of “believing,” and “work” to eventually gain some type of “salvation.” Some Christians even believe that this salvation can be lost proving that they believe salvation in Christ is works-based or at least has “works” as a component in order to retain salvation. I don’t believe this is biblical. But the world sees every religion as something the individual person must aspire to achieve until they reach…whatever; a higher state, nirvana, Utopia, etc. Because of this, the world also does not understand the spiritual component to Christianity. It is simply grouped together with the others. When a person embraces salvation, a spiritual transaction occurs. They become “born again” (John 3) and the Holy Spirit takes up residence within them (Matthew 3:11; James 4:5; Romans 8:9; 1 Corinthians 3:16; 2 Timothy 1:14). This does not occur in any other religious system, which is why all of them (having been created by Satan), can only offer very poor substitutes that seem authentic. So far, we’ve seen that the world tends to hate Christians because too many Christians have simply become issue-oriented. That is their focus and by doing so, they ignore the needs of actual people. In this article, we’ve noted that Satan has installed/planted tares among the wheat, which tends to confuse the world and cause them to make sweeping generalizations about Christians that are often wrong. Next time, we’ll look at the third reason why the world hates Christians. Entry filed under: christianity, Cultural Marxism, Demonic, Emotional virtue, eternity, Global Elite, Political Correctness, Politically Correct, Politics, Religious - Christian - End Times, Religious - Christian - Prophecy, Religious - Christian - Theology, salvation, second coming. Tags: born again, born from above, christian reconstructionism, christian right-winger, christianity, dominionism, salvation, wheat and tares. Why Does the World Hate Christians, Part 1? Why Does the World Hate Christians, Part 3?